One of my favourite restaurants in Germany has moved, so this is a good opportunity to write about it. 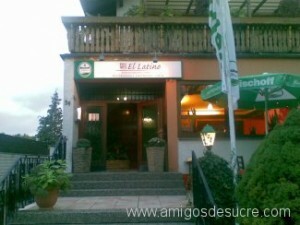 For the past 10 years I have been going to “Restaurant Latinoamérica” in Budenheim, just outside of Mainz. The restaurant has recently moved to Mainz-Finthen, where I visited it last week for the first time. This family-run business offers specialities from Bolivia, that you are unlikely to find in many other restaurants in Germany. And it is a family from Bolivia that cooks and serves it! (I even met them once on a flight from Santa Cruz to Sucre). One of our favourites has to be the Pique a lo Macho – spiced strips of beef with jalapeño slices, served on a bed of chips with salad. Be aware that one of the spices is locoto – which can be very hot. Another good dish is the Aji de Pollo, aji being another spice which is made of ground red peppers and in this dish it is a sauce that the pollo (chicken) resides in. Pre-booked, even Salteñas can be ordered. As a starter, we often have strips of deep-fried yuca, covered in melted cheese and served with a red dip called llajwa. The restaurant also serves Bolivian wines, and a special type of schnaps called Singani, made from distilled grapes. The new address is: El Latino, Borngasse 59, 55126 Mainz-Finthen. If you are going there on a Friday, Saturday or Sunday evening, then it is advisable to book a table in advance. P.S. Don’t forget to say that you read about it on AmigosDeSucre! Yesterday (6th August) was Bolivia’s national holiday. On this day, the President visits the constitutional capital – Sucre – and various organisations take part in a parade around the town square from where he traditionally waves to them from the balcony of one of the Government buildings. 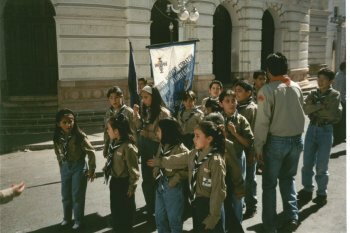 Among those marching are the Scout Groups from Sucre, and 9 years ago I was lucky enough to take part in the parade with one of them. This year the parade looks to have been slightly different. The online newspaper La Razón has a report this morning containing a photo of the President himself walking around the square. Was he leading the parade? Is this a new idea? Or did his predecessor do the same thing and I missed it because I was so far behind? Walking at the head of the parade may well be a sign that he is leading the country with the people rather than from above them, and comes at a time when parts of the new constitution are coming into force. The constitution not only allows President Morales to be re-elected in December, but is said to give more autonomy to indigenous communities. This fact alone must create some difficult situations, as last year one region did try to hold a referendum on autonomy, only for this to be opposed by none other than Morales himself. So is it one rule for indigenous communities, and another rule for the rest? We will have to wait and see what difference the new constitution really does make. Back to the national holiday, and I was hoping to see some photos of the event on the website of the local newspaper: Correo del Sur. But for some reason, their website is down. Not the best week for that to happen. Anyone know why? And whilst on the subject of photos, it is worth mentioning that at the end of the parade all of the Scout Groups get together for a District photo – something that takes some organising. I am on the photo that was taken in the year 2000, and was promised a copy of it. Unfortunately, I am still waiting for it. You are currently browsing the Amigos de Sucre blog archives for August, 2009.